Cleaning the coins in your collection should always be considered a very delicate process, and not something that is taken on with anything less than great care. Before any of the numerous methods, tricks or techniques can be discussed, it is best to review what may be the most important rules governing the art or science of coin cleaning. The First Rule of coin cleaning is probably the most critical, and will certainly influence the mode or manner that anyone will subsequently choose when deciding the merits or even the effectiveness of cleaning coins in general. If the value of a particular coin is unknown, then it is best not to clean it. If the value of the coin is in fact known, and it is indeed valuable, then do not clean it. In general, the best advice from most coin experts is never to clean them, and just leave them untouched and safely stored in their respective holders. This ironclad rule has its reasons, and it is because almost all coin dealers and collectors will only consider purchasing coins that have been kept or preserved in their original and natural state or condition. Examining this rule even further, it is also advisable to never clean coins with any type of commercial jewelry or metal polish, or tarnish removers. This is because these caustic substances will remove the ‘toning’ that appears over the life-span of most copper and silver coins. 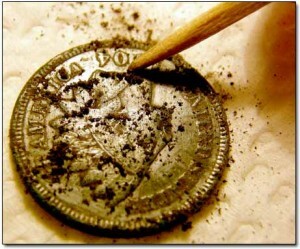 Attempting to remove tarnish may harm a coin, leaving tiny spots, scratches or pockmarks on the surface. The effect will almost always reduce the coin’s numismatic value by as much as 90%, while other studies indicate that up to 20% of coins presented to coin dealers are subsequently rejected due to the results of improper cleaning or polishing, or that the coin’s toning was considered to be chemically altered. The Second Rule of coin cleaning is just as critical as the first. If anyone thinks their coin needs cleaning attention, then it is wise to bring your specimen to a professional who knows exactly how to do it. Professional dealers and coin experts can either recommend or offer a coin cleaning process referred to as ‘dripping’, which is a technique that should never be tried by anyone considered to be an amateur. The Third Rule is a repeat if the second rule, and it simply reiterates that if any coin is in such a state of being so corroded that dates and details are impossible to decipher, then again, consult with a professional before damaging the coin further. This brings us to the Fourth Rule of coin cleaning. If the need to clean the coin seems to be unavoidable or undeniable, then it is strongly recommended that the least harmful method or technique be used. This rule is flexible enough for the reason that extremely dirty coins will eventually corrode or disintegrate over time, and become damaged to the point of being both worthless and beyond repair. It is also important to test a particular method of cleaning on coins that have no real intrinsic value before attempting it on more valuable specimens. This rule also has a secondary imperative, which advises that any collector should never attempt to use harsh or potentially damaging chemicals, vinegar, sulfuric acid, coarse or abrasive pastes, metal brushes, rock tumblers, rotating tools, or impacting devices, all of which can wind up turning your precious coin into a smooth, shiny, and worthless metal disk. And once again, if any of those coins are considered to be that valuable, then rules number One through Four come back into play. In the end, it is far better to be safe than sorry, especially when it comes down to the point of collecting coins in the first place – the unique and fascinating value and aspect of the coin itself could be lost forever. And by the way, there is in fact a Fifth Rule which may ultimately affect anyone’s decision to risk the possibility of seriously damaging any part of their prized collection. It states that if anyone is knowingly selling a coin that has been cleaned, they must disclose that information to the potential buyer. So, in other words, when it comes to cleaning coins, both the buyer, and the seller, beware. ← Can You Make Money Collecting Coins?